Earlier this year, the Indiana Department of Transportation (INDOT) released a 4-year comprehensive plan. If your community is on the list of expected improvements, have you thought about how the upcoming project will affect your underground utilties? Do you have a map of where your underground utilities are and know what will be affected (check out our Map Quiz to find out!)? What rights do you have? Who is responsible for what? Your mind might be making a list of questions by now, and we are here to answer them! Dylan Lambermont, P.E., LEED AP, is our Drinking Water Assistant Group Head and our in-house expert on utility relocations relocations associated with INDOT road projects. He has done a two-part Question and Answer in order to answer questions you need to know, including ones you may have not even thought of. Look for Part II of the Q&A coming soon! Why and/ or when would I need to relocate my utilities? 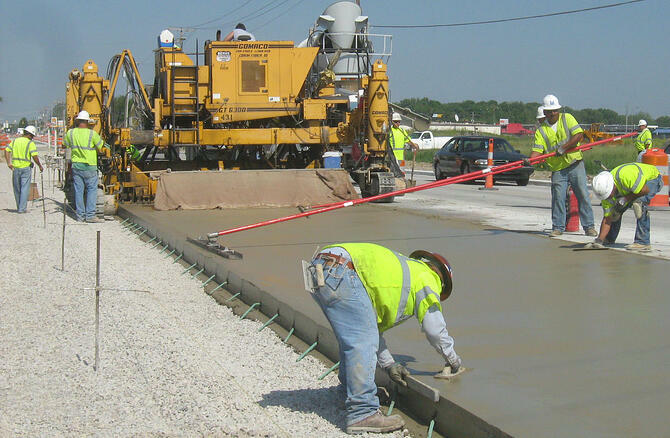 Utility relocations are often required when the Indiana Department of Transportation (INDOT) is performing construction on a state road in a community. Is there a good or ideal time to relocate my utilities? Utilities are relocated prior to or concurrent with INDOT’s work. How do I know if I need to even relocate utilities? INDOT will send a series of letters to potentially impacted utilities. They will attach the road project drawings and ask the utility to confirm the location if existing utilities and then identify any potential conflicts. Who should be involved in a utility relocation? The utility, INDOT, an engineer and a contractor. What are the benefits for relocating utilities prior to an upcoming road project? Prior relocation reduces coordination during the actual road work. And, when the utility is able to plan ahead for the utility relocation, existing and future needs of the utility can be incorporated into the project. What are some steps the utility should take before the utility relocation project(s) begin? Planning is important. Often times, utilities take the opportunity to increase system capacity or replace aged infrastructure during a utility relocation project. Knowing what your long term goals are will help to take advantage of an opportunity during a road construction project. This concludes part one of this series. Be on the look out for Part II coming soon. If you have more questions that were not answered, please feel free to contact us directly at 317-788-4551 or email us at info@wesslerengineering.com.